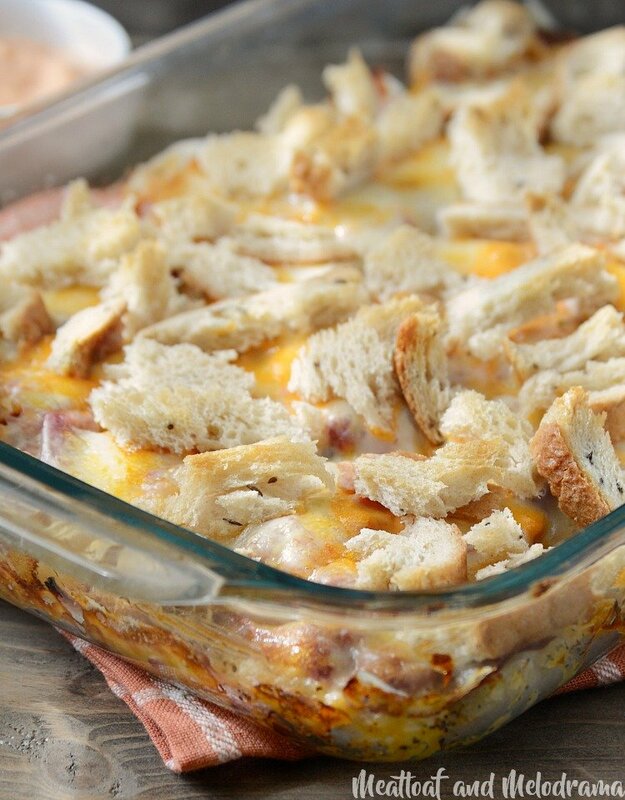 This Easy Baked Reuben Casserole is just like the classic sandwich, only it cooks in one pan. 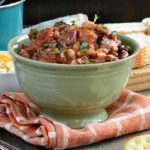 Perfect for a quick dinner and definitely comfort food! 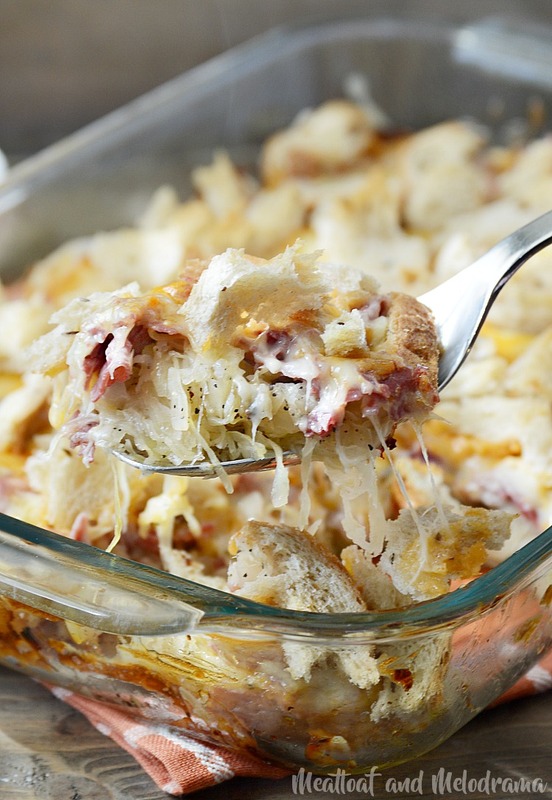 If you like reuben sandwiches, you’ll probably love this easy reuben casserole. It has everything you find in the classic sandwich — corned beef, sauerkraut, Swiss cheese and Thousand Island dressing on rye. The only difference is that you add everything to a casserole dish and bake it! This is another easy recipe I found in my mom’s old collection, and I have to admit that I almost didn’t make it. See, I’m not a fan of Swiss cheese, and the kids aren’t huge sauerkraut fans. And, I honestly prefer ranch dressing over Thousand Island. But, the more I thought about the flavors in this baked reuben casserole, the more I wanted to give it a try. 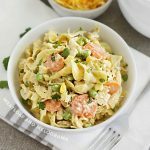 Plus, I wanted a quick and easy dinner to make on the weekend, and this easy recipe was exactly what I needed. Basically, all you do is assemble the ingredients in a baking pan, bake it, and you’re done. It doesn’t get much easier than that! The original recipe didn’t specify the amount of cheese and dressing to use, so I just guessed. 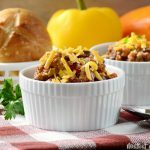 My version uses sliced Swiss cheese, but you can use shredded or add more if you want. I also added salt and pepper to the sauerkraut, since I like to season each layer. And, I just think that sauerkraut tastes so much better when it has some salt and pepper added! I used Russian rye bread to top off the casserole and mimic the sandwich. And, because I didn’t want the bread to be too dry, I added some melted butter over the top. The original recipe called for bread crumbs, but I just tore the bread into large pieces, which was so much easier! And you know what? 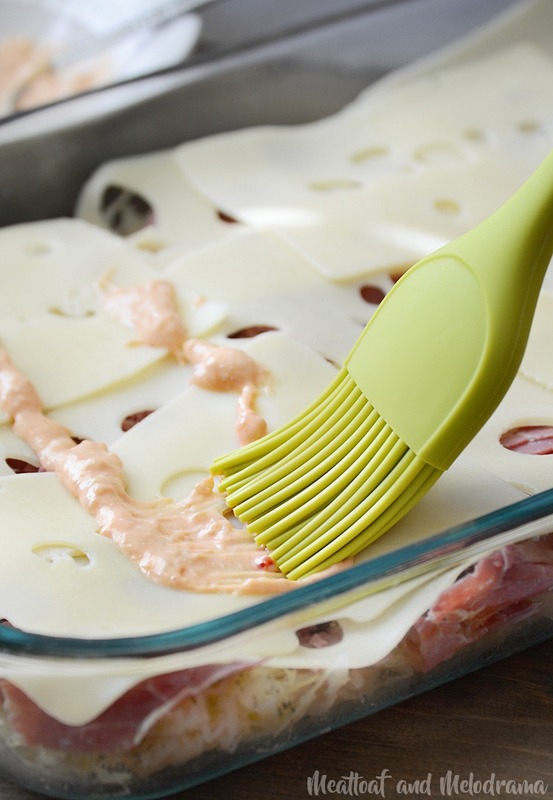 I loved this easy baked reuben casserole, and so did my family. Honestly, even the picky eaters had no complaints, which really surprised me! They ate every bit of it, sauerkraut, Swiss cheese and all! 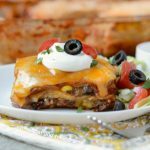 Easy baked reuben casserole is a quick and easy dinner made with corned beef, sauerkraut, Swiss cheese and Thousand Island dressing topped with rye bread. 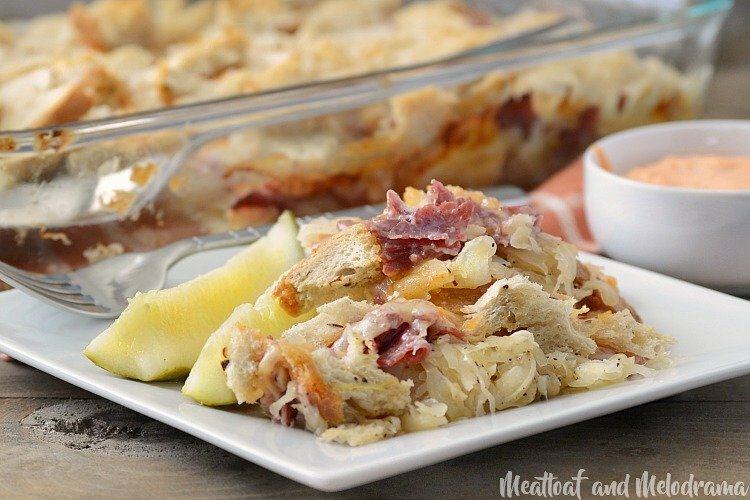 It tastes like the classic reuben sandwich, only in casserole form. I hope you enjoy this quick and easy baked reuben casserole as much as we did! Awesome! I love it when my family has seconds! Wow!!! This is such a great idea! This is my idea of preparing dinner! Easy peasy and bam….a fantastic meal!! What a delicious, FUN idea! I’m not a huge sandwich fan, but I love the flavors of a Reuben, so I bet this would be a new favorite of mine! Now, why have I never thought of making a reuben into a casserole before? Genius! I made this for dinner tonight and it’s wonderful. No more messy sandwiches. We loved it. Thank you so much. I love a lot of your recipes. Awesome! Thanks so much, Nancy. You made my day! What a fun idea — I love this! I love Reuben sandwiches. Bet I’d need fewer napkins with this casserole! Love! This looks delicious! I would have never thought to make the classic into a casserole! We just tsarted the Whisk It Wednesday Link Party and thought you might want to share there too! Thanks, Carrie. I’ll have to check it out! This looks really good! My husband loves Reuben sandwiches so I’ll bet he would love this. I’ll have to put it on my menu soon. 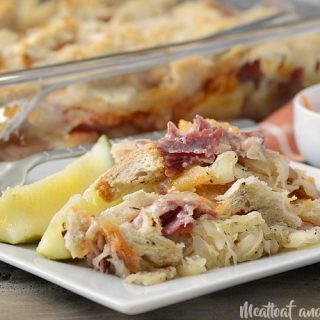 I love all that Reuben goodness in one casserole, awesome! Thanks so much for sharing your post with us at Full Plate Thursday! Have a great week and come back to see us real soon! This is a delicious recipe. The only thing I do differently is change the layering. I add the Thousand Island dressing over the corned beef and then the cheese. I place the bread cubes on the cheese. They stick to the cheese and crust up nicely. Enjoy. Can this be made ahead and refrigerate until baking time? This was so delicious!! I used up St. Patty’s Day corned beef and cabbage! I melted a TB of butter in the baking pan then added torn up dinner rolls, and sprinkled some caraway seeds over the bread. Then I layered cooked chopped cabbage, sliced corned beef, provolone cheese, Thousand Island dressing (had to make some) and topped with more bread crumbs (torn up roll) with caraway seeds. Topped it of with some melted butter. Wow was it crispy, crunchy, cheesey, and wonderful! Best way ever to use up leftovers! Great recipe!! !